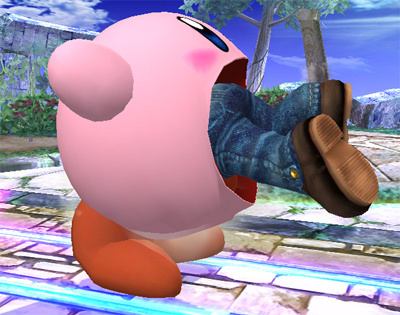 Not to be outdone, Kirby sabotages the platforming competition. It's been a long time coming, but it looks like a Kirby adventure might actually make it onto Wii yet. According to Official Nintendo Magazine UK, a list of upcoming Nintendo releases attached to the company's Financial Results Briefing document includes the elusive Hoshi no Kirby, or Kirby of the Stars as the Queen would say. Unsurprisingly, the entry doesn't have an associated release date other than To Be Announced. The pink puff has made appearances in many games over the years, but the last time a home console saw a brand-new Kirby platformer was 2001's Kirby 64: The Crystal Shards. Before you get too excited, keep in mind that a Kirby Wii game has been on release schedules for years and has yet to even be shown, making the game something of a unicorn. That being said, let's connect some speculative dots. The June issue of Nintendo Power has a big teaser page at the end with a block of text saying that their July issue will have, among other things, an exclusive reveal of a "huge new title." 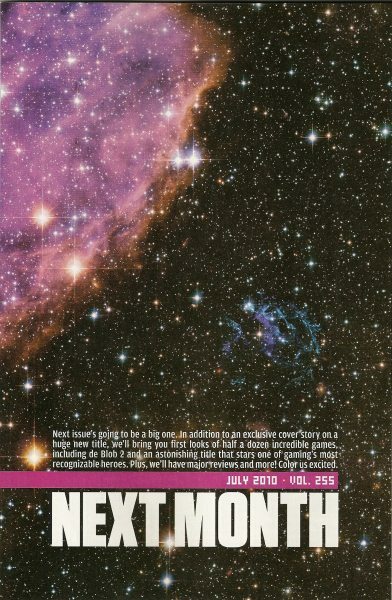 The text is placed on top of an image taken in space with a large pink nebula in the top left quarter. Magazines tend to name their issues a month in advance, so the July issue will actually be released in June right around the time of E3. Again, the listing is not conclusive proof that Kirby will finally star in a new adventure, but it seems as likely as ever. Interesting. It'd be nice to see Ninty make another 3D platformer besides the Galaxy games. In June? Best birthday present ever. Um, yeah, it's said that for the past.....few years? It better come out this time, or I'm gonna be angry. I predict a Kirby-rolling game that uses the Balance Board. Kirby is back! Hope the wait is worth it. Cool, its been a long time since Kirby 64. Ill be playing this one hopefully soon. If this is true, I would deftinely buy it. A new 2.5D Kirby platformer is would be awesome. In general they haven't really put much focus into their other characters aside from Samus, Link, and Mario. In comparison we got Luigi's Mansion, Kirby Air Ride, 2 Starfox, and several Donkey Kong games for GC. Of course these games didn't get the Mario treatment, but at least they still came out. I would like to see a 3D Kirby platformer. I think Ninty is just scared to put effort into any other characters, but they need to continue to innovate. DK also needs a platformer! This is it. The clue in Nintendo Power was a kirby wii game. It showed a picture of stars meaning Warp Star. If I'm right I'm going to pat myself on the back. This same Kirby has been hinted or teased since 2005 or 2006, for the Gamecube at the time. I'd love to see it, but I definately ain't holding my breath. Hopefully E3 will be able to shed some light on this. I remember that old Kirby game that was teased a few years back. I thought it had died, but maybe there's life in it yet. YES. Yeah, ahem.. I'll hold the excitement until the date draws nearer.. This better not turn out like the Pikmin scandal lol. Where they showed a tiny pikmin hidden in a pic and everyone thought it was going to be Pikmin 3, but it turned out it was just the new play control ones. I would love to see a new Kirby game for the Wii. I expected it sooner, especially after Super Smash Bros. Brawl. Thats cool I love Kirby games. A kirby game is also on the list you are talking about. I never comes out though. This time though is no different so there. I hope it'll come anytime soon, I've been waiting for a long time. Well, I love that Kirby Wii is still alive but I hope more info is dished out soon, maybe E3. I can bet that HAL Laboratory and Project Sora could be working on it. Sakurai did an ace job on Brawl so bringing back the designs of Kirby, Meta-Knight and King Dedede from the game itself could peak some serious interest. Knowing Nintendo now its probably gonna be some casual game like on the balance board or something. @Kevin If You're right, Nintendo is really shooting itself in the foot and slapping its fans across the face in the process. What the game needs is simple Wii-remote-held-sideways gameplay with the option to use the Classic Controller or GameCube controller. Hoshi no Kirby was unfortunately canceled for GameCube because Nintendo was needlessly quick to dismiss GCN after Wii was released and now what's left of the game hangs in limbo. I'd rather the game was released for GameCube as originally planned, but I'd settle for a Wii release. wasn't this already released in japan? I remember seeing screenshots of the GCN version a long time ago... good times. Kirby games are awesome. Loved Canvas Curse, 64, and Super Stars. Hoping for a 3d one or awesome 2d one. I don't like the idea of having 4 kirbys on screen like that GCN was. I miss some Kirby action ever since I beat Squeak Squad. I'm looking forward to that June issue! I've been a Kirby fan long enough to know that Kirby will only appear on a console in platformer form in the last 2 years of a console's life. In fact, the Game Cube one was SO late that it didn't even make it out the door. Also I've been a Kirby fan for 15 years, and never once have a heard Nintendo Power consider a Kirby game "a huge new title" I'm expecting the June announcement to be Pikmin. No way would Nintendo Power ever make a huge tease like that for a Kirby game. Kirby must be 2D. End of story. I just hope Nintendo means it this time. OMG, it's in space! Maybe it's actually Star Fox! Who knows, we'll just have to wait for E3. You had me up 'til Official Nintendo Magazine UK. How would Nintendo Power know something massive is coming before the internet does? I'll believe it when I see some screen shots or a trailer. until then I'm not getting excited over this. I hope it do happened and also they need to make a kirby dreamland 4 and another super star game. @JimLad They knew Mega Man 10 was coming out before the rest of the internet. I always wanted the Kirby Tilt And Roll game (supposed to be on Gamecube in 2001). After 2 years delay, Kirby was dropped and it was called tiltorama or something with some generic pink marble. Then I think it was either never released, or terrible. Hopefully we will see a full 3D kirby game based on the 2d ones! sounds good... although instead of speculating, you guys should snap up some of kirbys awesome older games: the amazing mirror, canvas curse, nightmare in dreamland and squeak squad are all there for the taking on ebay! those should hold us over until nintendo finally gets around to releasing this mythical new kirby. I already played all those, so I have nothing to tide me over. Um, EVERY Nintendo financial listing for the last 5 years has had this Kirby game listed. So this article is just more baseless speculation, I came here expecting some info.